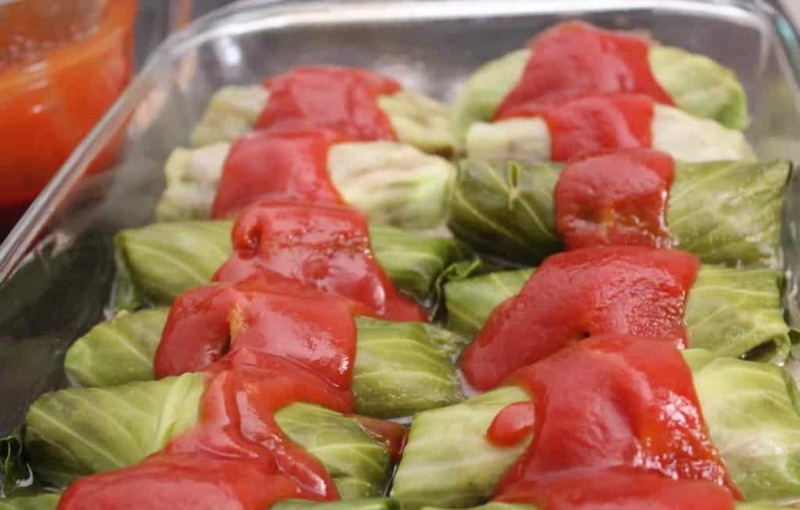 Stuffed Cabbage Rolls are relatively easy to make and quite healthy! 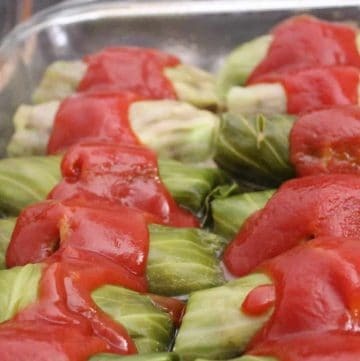 Stuffed Cabbage Rolls are one of our family favorites! The dish is, based on my research, originally from Poland–called golumpki. Apparently, there are many names for stuffed cabbage as it is a staple menu item in not only Poland, but Hungary, Ukraine, Greece, France and Russia. This recipe is a simple, low-carb version of original Polish recipes (it does not include rice). Interestingly, the original versions called for a can of tomato soup as the sauce on top, but I prefer to make my own because 1) I don’t have a can of tomato soup and 2) I’ve been making this same delicious sauce for over 25 years. 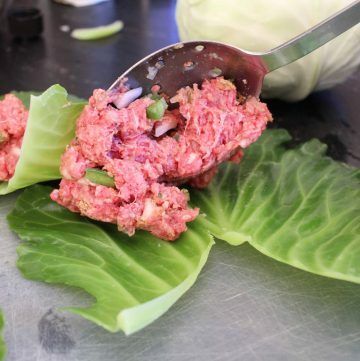 How Do I Prep The Cabbage for Stuffed Cabbage Rolls? Heat a large pot of water on high, almost, but not quite to the boiling point. With a paring knife, core the cabbage. This means you cut around the core and remove it; rinse the head of cabbage and gently pull away the outer leaves. Place the leaves in the hot water until they are tender. Using tongs, remove the leaves and set aside. Once the leaves are cool enough to touch, cut a “V” near the bottom of the leaf, removing the tough part of the leaf stem. This will allow the leaves to be more flexible once they’re stuffed. How Much Filling Do I Put in Each Cabbage Leaf? It really depends upon the size of the cabbage leaf. The outer leaves are usually dark green, larger and more tender than the inner leaves. Start with 1/2 cup of filling and if it looks skimpy, add more. Don’t worry about serving different colored “green” leaves; once the sauce is added, no one will notice. Once you’ve stuffed the leaves, place them in a baking dish (that has about 1/2 inch of water) seam side down. How Do I Roll The Leaves? Place a spoonful of filling in the center of the leaf; pull the “V” parts up over the filling; tuck in the sides of the leaf and continue rolling. What Do I Stuff the Cabbage Leaves With? This recipe calls for a beef stuffing with onions and bell peppers; however, a genuine “Polish” recipe will include pork and/or rice, and perhaps sauerkraut. 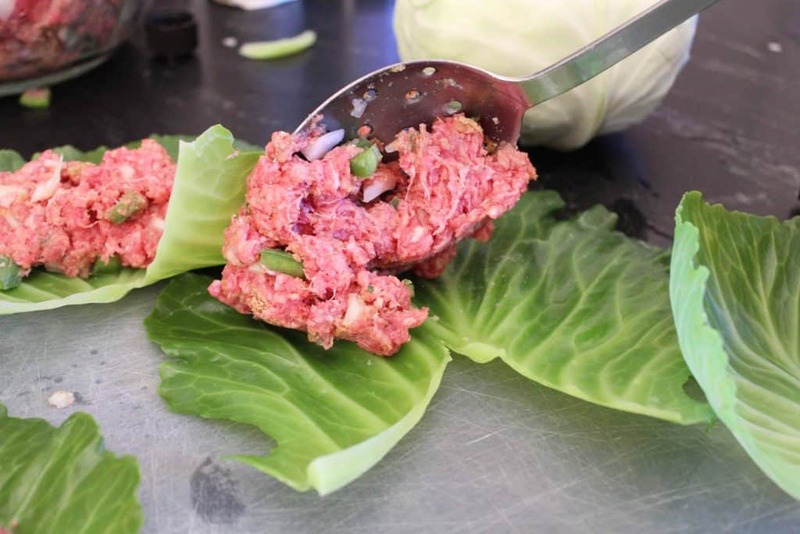 Stuffed Cabbage Leaves filled with seasoned beef are a delicious way to combine protein and greens in one dish! 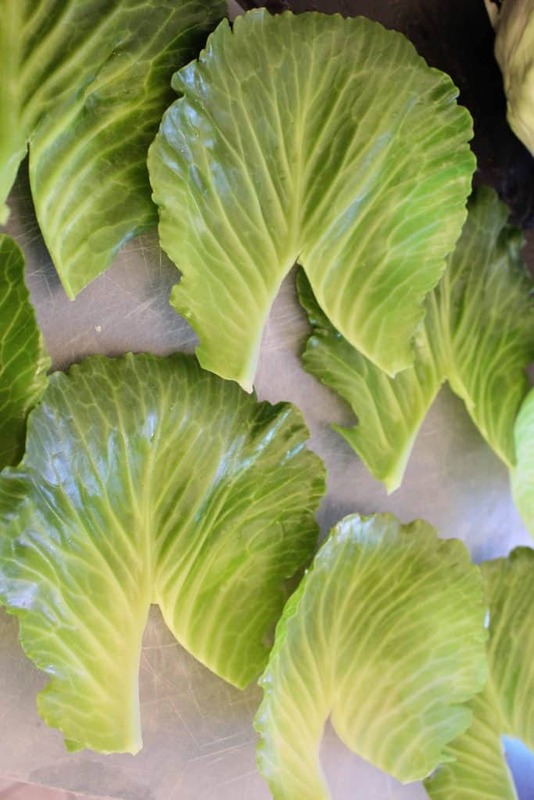 Repeat with leaves and meat combination; place rolled cabbage leaves tightly in the baking dish so they won't "unfold"
Need a side dish for Stuffed Cabbage Rolls? Try making my homemade cornbread recipe!